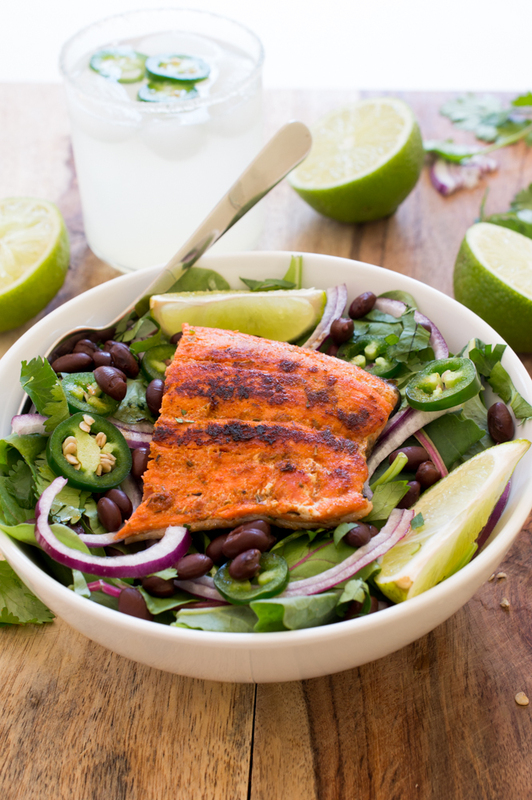 Mexican Salmon Salad with a Creamy Cilantro Lime Dressing. Full of flavor and ready in less than 20 minutes! Perfect for busy weeknights. I am always looking for quick weeknight meals that are also healthy. Something I can throw together in less than 30 minutes that isn’t loaded with calories. 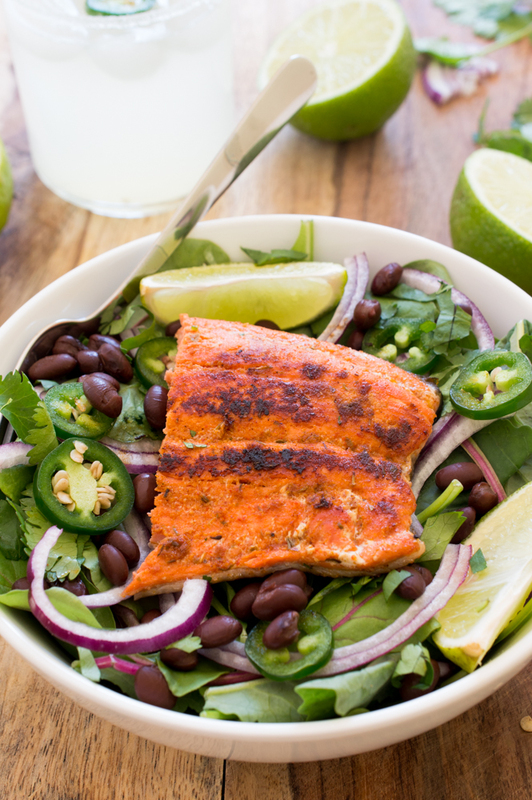 This Mexican Salmon Salad is the perfect healthy and fast meal for a busy weeknight dinner. This salad is full of flavor and is so easy to throw together. I seasoned the salmon with a homemade Mexican spice rub. It is a blend of paprika, garlic powder, onion powder, oregano and cumin. The spice blend gets rubbed on the salmon before it’s seared in a hot skillet. The base of the salad is a mix of baby kale and arugula. You can use whatever lettuce you have on hand. The salad is then topped off with thin slices of red onion, jalapeno, black beans and fresh cilantro. I used Alaskan sockeye salmon fillets in this salad. Alaska seafood is high in protein, low in saturated fat, low in sodium and one of the best sources of heart-healthy omega-3 fatty acids. Alaska supplies nearly 60% of the nation’s seafood and about 90% of North America’s salmon comes from Alaska. With five species of salmon, several varieties of whitefish, and numerous shellfish species, Alaska offers mouthwatering seafood options for every taste and cooking method and is available fresh, frozen and canned year round. Now let’s talk about this awesome dressing. It is similar to my Honey Jalapeno Dressing without the jalapeno. It’s slightly sweet, tart and super creamy. The dressing gets nice and thick thanks to the Greek yogurt and extra virgin olive oil. I also add fresh cilantro and fresh squeezed lime juice. Honey is added to offset the tart lime juice. All of the ingredients are added to a food processor and blended until creamy and thick. You will have extra dressing left over. I like to store the extra in the fridge to use throughout the week. Only requires a few ingredients. 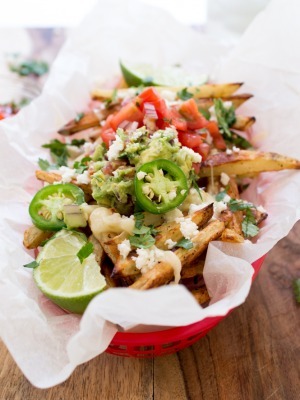 ….and is drizzled with the Creamy Cilantro Lime Dressing. 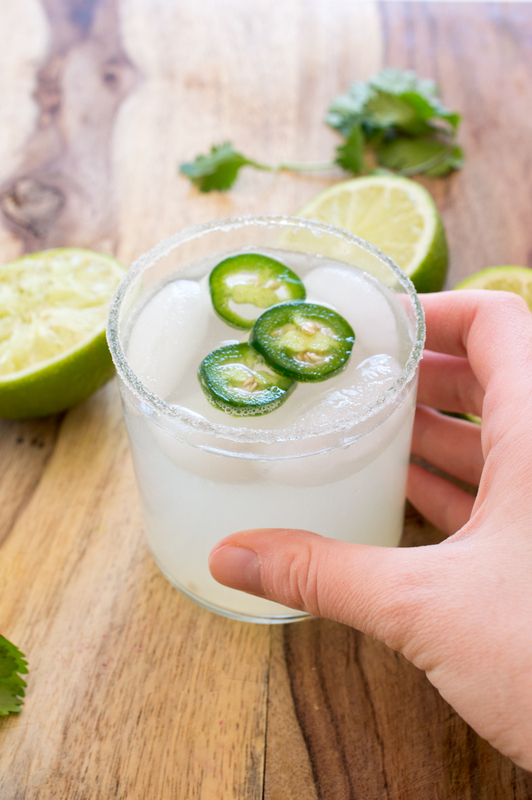 Serve with my classic margarita or add some jalapenos for a spicy twist. 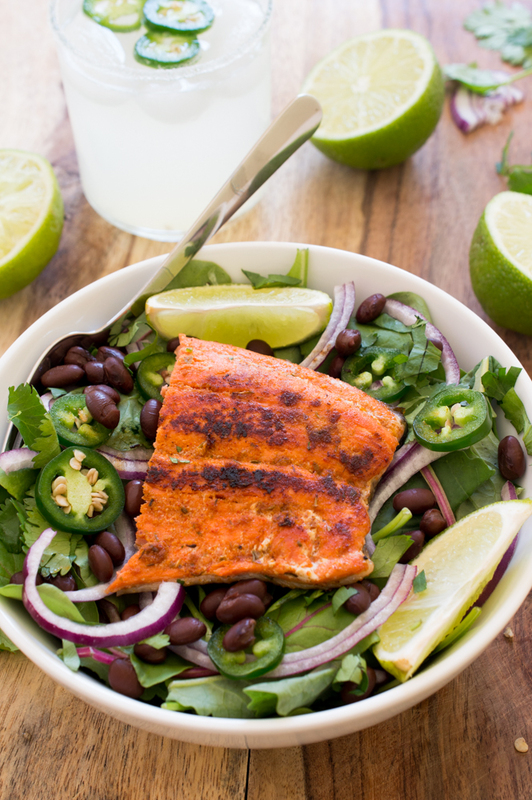 Love this Mexican Salmon Salad? Here are some more salads you’ll enjoy! Drizzle a little extra oil on the fish. Add the Mexican Spice Rub to the salmon and rub it in with your fingers. Add salmon to the skillet and saute until fully cooked, about 3-4 minutes on each side. To assemble the salad place lettuce in a large bowl and top with jalapeno, cilantro, red onion and black beans. 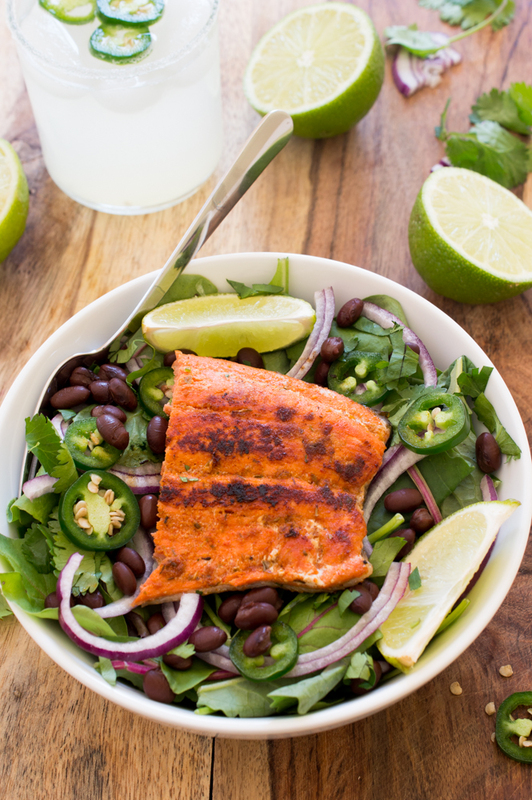 Top with the cooked salmon and serve with the Creamy Cilantro Lime Dressing. Combine all of the ingredients together in a small bowl. Set aside. Add all of the ingredients to a food processor. Pulse until combined. Place in the refrigerator until ready to serve. I love the flavors of this salad, Kelley! My husband and I eat salmon often, so I can only imagine how delicious it must taste in this zesty salad. Yum! 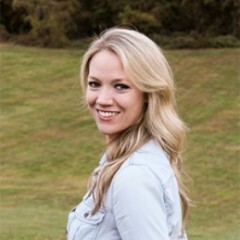 Love your salads Kelley! And the salmon looks perfect! Pinned! You have combined some of my favourite flavours. I love how light and fresh this salad is. I’ve never thought of combining salmon with Mexican flavors, but what a great idea! Sounds like a super tasty and healthy meal option! That rub looks amazing and with that dressing…I can only imagine how flavorful this dish is! 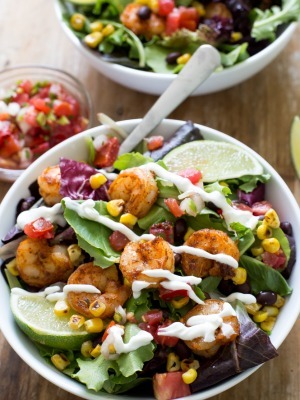 This salad and that margarita sound just absolutely PERFECT together! I could slurp up that dressing with a spoon, Kelley! This salad looks incredible! There are some REALLY delicious flavours here, Kelley! I especially love the idea of the spices and herbs you rubbed on the salmon. I tend to be lazy when cooking salmon and really do nothing to it other than drizzling over a bit of olive oil, but now you’ve made me want to go a bit wilder and throw on some flavours! This was incredibly yummy!! I will be preparing the dressing for other salads in the future too. Thanks! !